Implants are used to replace missing roots and support artificial replacement teeth. They are comfortable and look like natural teeth. A dental implant is an artificial root made of titanium metal. It is inserted into the jawbone to replace the root of the natural tooth. An artificial replacement tooth is attached to the implant. The implant acts as an anchor to hold the replacement tooth in place. Dental implants will fuse with bone, however they lack the periodontal ligament, so they will feel slightly different than natural teeth during chewing. Dental implants can be used to support a number of dental prostheses, including crowns, implant-supported bridges or dentures. They can also be used as anchorage for orthodontic tooth movement. If you are in good general health, have healthy gums and have enough bone in the jaw to hold an implant, dental implants might be right for you. If your jawbone has shrunk or if it has not developed normally, you may be able to have a bone graft to build up the bone. In your initial consultation, your dentist will be able to determine if you are candidate for dental implants. Your dentist will carefully examine your mouth and take x-rays of your head, jaw and teeth to determine if dental implants are right for you. During the first stage, your dentist will put a dental implant into your jawbone beneath the gum tissue. The gum tissue is then stitched back into place. As the tissue heals, the implant will bond with the bone and attach to the gum. It can take several months to heal. 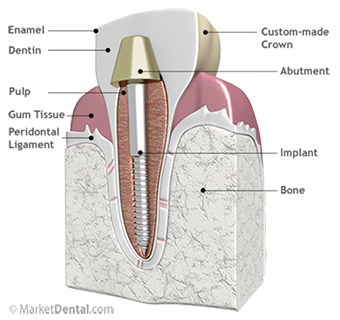 During the second stage once the tissue is healed, your dentist will attach an abutment to the implant. An abutment is a post that connects the replacement tooth to the implant. In some cases, the first and second stage of implant surgery may be done in one single stage. An artificial replacement tooth is made and your dentist attaches it to the abutment. It may take several appointments to properly fit the replacement tooth to the abutment. When replacing several teeth or all of your teeth, a fixed bridge is anchored to your dental implants. A bridge is a dental restoration that replaces one or more missing teeth by spanning an area that has no teeth. The bridge is held firmly in place by dental implants on each side of the missing teeth. To set up a Free Dental Implant Consultation with our dentist, contact us now.